When a camping adventure is on the horizon, your compass should be pointing the way to North Carolina. Home to some of nature’s most perfect masterpieces and a diverse array of recreational opportunities, the state features a wide variety of ways to commune with nature and find limitless adventure among the peaks, valleys, lakes, and beaches that set the scene for the experience of a lifetime. The Blue Ridge Mountains provide the scenic backdrop to a genuine Carolina adventure at Mount Pisgah Campground. 127 sites accommodate guests in tents, trailers, and RVs. There are no electric hook-ups at Mount Pisgah, so this location is best for a more primitive experience. The uniquely high altitude (5,000 feet) of the campground allows for panoramic views of the majestic landscape and crisp, cool evenings, as well as notable hiking trails. Mount Pisgah Campground is home to the head of The Frying Pan Trail, a 1.6 mile trail leading through dense hardwood forests to Frying Pan Fire Tower, a decommissioned lookout tower that is still accessible for breathtaking views of the area. If the mood hits to take in some shopping, dining, or attractions, the charming and beloved town of Asheville is only 20 miles away. Situated within the Pisgah National Forest, the Davidson River Campground borders its namesake waterway. The lush hardwood and conifer wilderness, cascading waterfalls, and crystal-clear river create an inviting natural environment that’s ideal for swimming, tubing, and fishing. The Davidson River is considered one of the premier trout fishing spots in the southeast. The 144-site campground accommodates both tents and RVs. Sites are mostly shaded, with picnic tables, grills, and access to diverse hiking trails – a number of which are nestled along the waterside. Onsite educational programs are offered during the summer and fall to enhance this traditional family-friendly experience and encourage ecological stewardship. Davidson River Campground is located just a few miles from the small town of Brevard, home to impressive breweries and historical sites. Ecologically-speaking, Merchants Millpond State Park is one of the most unique camping destinations in North Carolina. The combination swampland-hardwood forest environment yields a scene that is often described as an “enchanted forest” of remarkable native species – 200 types of birds, alone! A selection of camping styles are available Three types of sites are available, including primitive backpacking sites and remote canoe-in sites accessible by paddling trails. The park is centered around the 700-acre millpond and Lassiter Swamp, which once served as a thriving center of trade in Gates County due to its gristmills, sawmill, and farm supply store. Today, the site provides a tranquil setting for picnics, fishing, and canoeing. Visitors to Jones Lake State Park play witness to one of the world’s great geological wonders – the phenomenon of the Carolina Bays. Thriving habitats, teeming with biodiversity, the Carolina Bays are shallow, oval-shaped pools or depressions along the coastal plain. Origin theories range from natural forces to astronomical events. Adjacent to the Bladen Lakes State Forest and home to Jones and Salters lakes, the 2,000+ acre park hosts just 20 private campsites and a score of outdoor activities on land and in water. Woodland campsites provide fire rings, grills and picnic tables, with only one site providing electrical and water hook-ups. Tall pines and large cypress trees draped in Spanish moss encircle the sandy shores and bogs where guests peacefully partake in canoeing, swimming, sunbathing, and fishing in shallow, warm waters. Hikers will delight in the tranquil Lake Trail that loops around Jones Lake. The visitor center at Jones Lake is a great place to start researching the rare ecology of the area. Additionally, park rangers regularly host educational programs about Jones Lake State Park. Stone Mountain State Park offers guests the complete campground experience, with original “extras” you won’t find anywhere else – such as the massive 600-foot granite dome that shares the park’s name. Dense forests and sweeping meadows welcome native woodland species like white-tailed deer. The park lands spread across two counties and 13,500 acres, encompassing 16 miles of trails and 17 miles of designated trout waters. 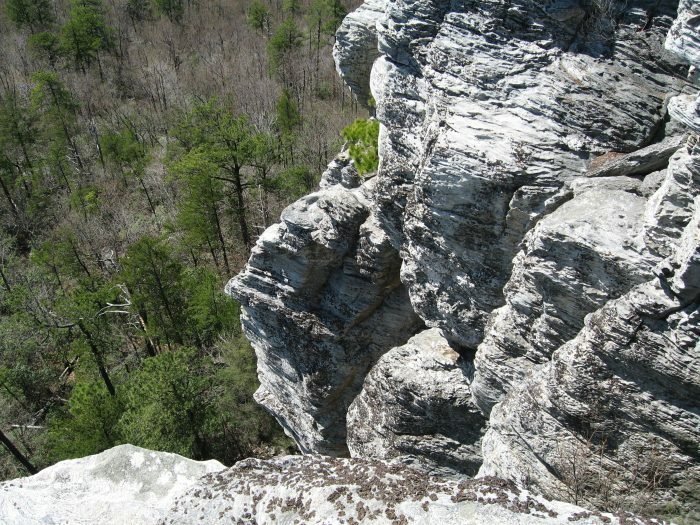 Stone Mountain, a National Natural Landmark, is a sought-after site for rock climbing and rappelling (by permit only). For a milder adventure, guests may explore numerous trails of ranging challenge levels, along with the remnants and artifacts of the park’s history at various marked historical sites, old homesteads, and the Mountain Culture Exhibit in the park office. The onsite Garden Creek Baptist Church, established in 1897, still holds Sunday services seasonally. The campground offers 90 sites (some include utility hook-ups), with group and backcountry options nearby. Hammocks Beach State Park is dominated by the the three-mile-long undeveloped barrier island of Bear Island, only accessible by kayak, canoe, or passenger ferry. Primitive, beachside camping on Bear Island offers stunning ocean views, fishing, swimming, and exploration via paddling and hiking trails. There are 17 campsites, three of which are reserved for group camping. Notable residents of Bear Island, loggerhead sea turtles are known to come ashore to nest here between mid-May and late August. Huggins Island, between Bear Island and the mainland, has thick forests of large live oak trees to wander, but this island is best left to passing curious afternoons, as camping is prohibited here. Hammocks Beach’s unspoiled lands serve as a haven for migratory shore birds in the spring and fall, while bottlenose dolphins regularly visit the park’s coastline. A 6,512-acre lake with more than 150 miles of shoreline serves as the centerpiece to Lake James State Park. The park provides scenic vistas of the Appalachian Mountain range along an extensive, 25-mile trail system, including the historic Overmountain Victory Trail and the short, educational Holly Discovery Trail. 15 miles of the trails are also open to mountain bikes. There are three campgrounds within the park at the Catawba River area (20 walk-in sites), the Paddy’s Creek area (33 drive-to sites), and on the Long Arm Peninsula (boat-in sites only). Boat, water ski or fish in the lake’s cool mountain waters, or enjoy a family picnic along the quiet shores. Pleasure Island is a coastal barrier island just minutes from an International airport, zoo, and golf courses. It is also the site of the 761-acre Carolina Beach State Park. With 83 campsites shaded by mighty oaks and pines, and miles of trails that traverse sandy beaches and thick forests, the park is a testament to natural wonder. Among the abundant natural landscapes, guests will marvel at the striking Venus flytraps that grow wild alongside the trails. Camping style options include from tent, RV, camper cabins and group sites. Make sure to visit the onsite marina – home to some of North Carolina’s best fishing spots. For a change of pace during your stay, visit the port city of Wilmington, just 13 miles away. Here, you’ll find gardens, museums, breweries, and Jungle Rapids Family Fun Park. Nearly twenty miles of hiking trails lead to breathtaking views and cascading waterfalls at Hanging Rock State Park in the Sauratown Mountain Range. Spectacular overlooks and striking horizons are borne from the combined presence of prominent peaks, mighty oak-hickory forests, the summit of the Piedmont Plateau, and the lush rolling countryside dotted with mountain laurel, wildflowers, and blended hemlock. Beyond the hiking trails, vast opportunities for all-day adventure exist across 8.4 miles of single-track mountain biking trails, and multiple rock climbing sites (accessible by permit only), while the 12-acre lake plays host to swimming, canoeing, and boating. 73 campsites accommodate both tents and RVs alongside five group sites and 10 cabins. Two centrally-located picnic areas provide 60 tables and 15 grills. 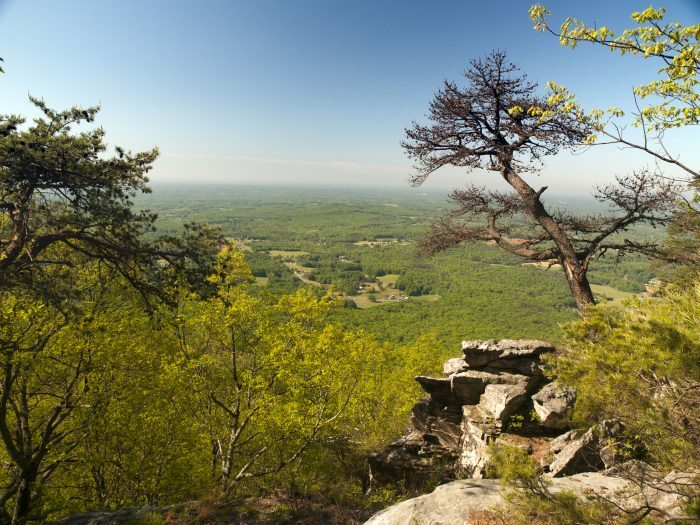 Hanging Rock State Park was previously named one of the Top 20 State Parks by USA Today. Situated beneath a mix of oak and hickory trees and the distinctive 2,241 foot peak of Pilot Mountain, Pilot Mountain State Park features family-friendly recreation amidst some of North Carolina’s most glorious backdrops. The 49-site family camping area welcomes tents and RVs, or opt for one of two canoe-in sites along the shores of the Yadkin River. The Yadkin River Canoe Trail is 165 miles long, two miles of which pass through the park, offering prime fishing opportunities. Hike the 6.5 mile trail corridor connecting the river to the mountain summit, where blueberry, huckleberry and grapes grow wild, or take on the family-friendly adventure of trekking the Little Pinnacle Overlook Trail. Rock climbing and rappelling are allowed in designated areas by permit only. Regardless of the type of camping getaway you seek, or your level of outdoor experience and skill, North Carolina is the premier home base to pitch your tent, hook up your RV, or beach your kayak when a memorable vacation is the goal.